I am becoming slightly obsessed by yarn – in fact I think I’ve probably got enough to open a shop but I can’t help myself – too many bargains and too many projects to conquer! I blame Lucy at Attic24. She happened to mention that Wool Warehouse were having another of their fantabulous sales and I just can’t resist a bargain so off I trotted into internet land to get myself something gorgeous for another project I am planning. Yes, I know, shouldn’t I finish off my other projects first! Well, quite frankly, no I should not, otherwise I will become bored and have nothing to chop and change between. Mind you, what with the Granny Stripe Blanket and my Random Stitch Blanket currently on the boil perhaps another project is a project too far! 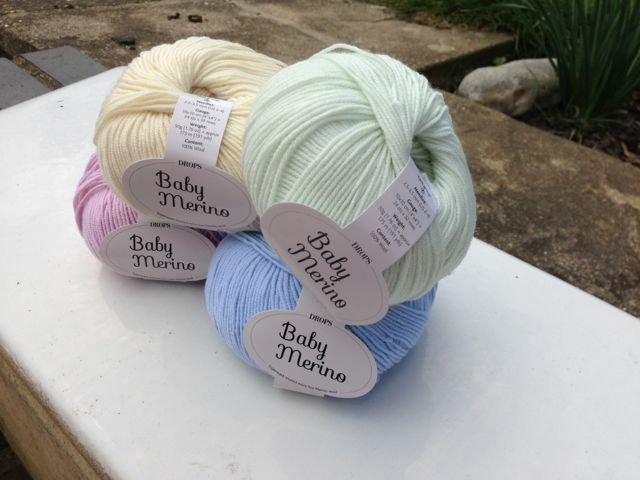 Sadly my itchy internet finger didn’t agree and before I knew where I was, twenty balls of the most beaudelicious, soft and cuddly, scrumptious-coloured Baby Merino yarn found its way into my basket and, Pow!, several PayPal clicks later and it was mine! And I think you’ll agree that it is soooooooo gorgeous and soft and squidgy and full of baby loveliness! Sorry, I need to calm down. Normally £3.10 per 50g ball, this is currently £2.00 ladies and gentleman, so grab yourself a bargain while you can! – and thank you Lucy for your tip! What’s the project then, I hear you scream. 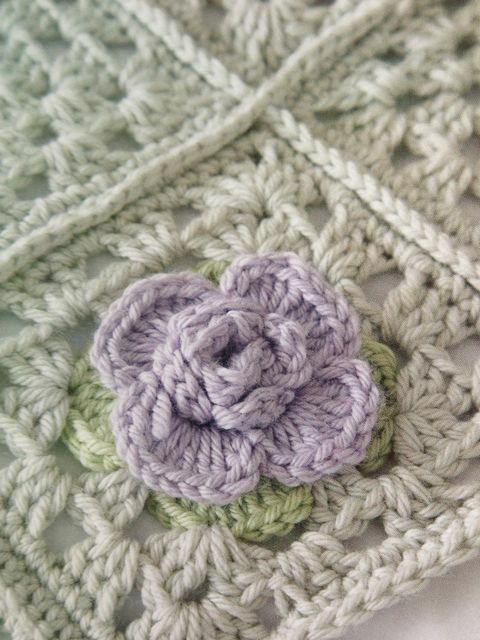 Well – wait for it – I am planning to do a beautiful baby blanket for my cousin’s daughter (never sure if this is my second cousin or cousin once removed but anyhow). She is expecting her first baby in August so I have a few months to get organised and finish the blanket. 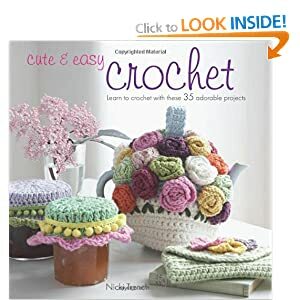 I’ve chosen a pattern from Cute and Easy Crochet called the Camellia Blanket which has plain granny squares interspersed with ones with the most gorgeous flowers on and the Baby Merino I have chosen is in four colours – Light Yellow, Ice Blue, Light Old Pink and Light Mint. 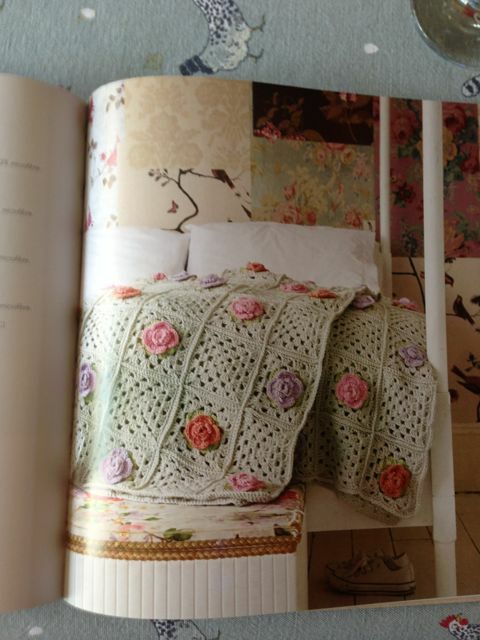 Here are a couple of pics of the blanket but if you want to know more, then go buy the book! I think you’ll agree – too gorgeous for words! It seems quite a fine yarn so I am going to start with a 3.5mm hook and see if this works. Watch this space, fellow happy hookers.